You will never believe how easy this beauty hack is! I stumbled across this idea a while back (I don’t recall where), and my mind immediately started spinning with other kinds of liquid that would be handy in the form of a pen! 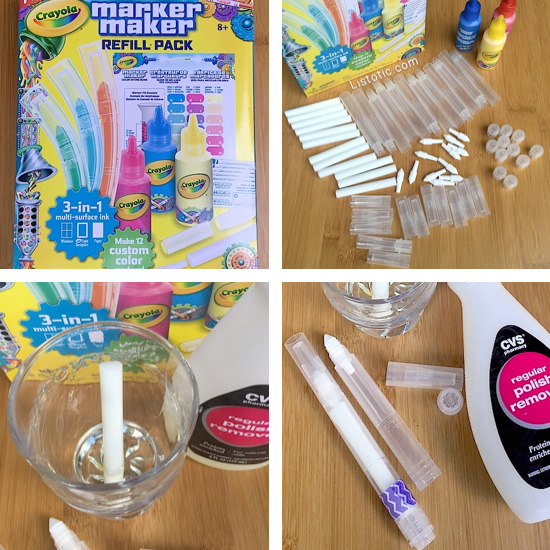 Thanks to Crayola Marker Maker Refill Packs, you can easily make pens filled with nail polish remover, makeup remover, perfume, bleach or anything else that would make your life easier as a pen. Nail Polish Remover — to help clean and correct any excess nail polish left on your cuticles and skin for a cleaner manicure. Makeup Remover — To quickly correct makeup smudges and eyeliner mistakes. Perfume — To make applying just a touch of perfume easy when you’re on-the-go. Just keep a perfume pen in your purse, they’re great for airline travel as they’re not considered a liquid! Bleach — Although I haven’t tried it, this could work for touching up small stains before throwing them in the wash, or for creating art on a t-shirt, pair of jeans or other piece of clothing. A cup to put the liquid in if your container doesn’t work for soaking. Each marker comes unassembled in 5 separate pieces (a core, tip, barrel, plug and cap). Take a core piece and let it soak in your liquid for 2-3 minutes. I used a cup for the nail polish remover because my bottle was more than half gone. While the core is soaking, insert a tip into the top of one of the barrels, and then insert your soaked core inside of the barrel. Finally, place your end plug on the bottom of your pen. That’s it! This pack also comes with labels, but I used washi tape to identify my pens because I thought it looked nicer. A permanent marker wouldn’t hurt either to make sure you don’t get your pens mixed up. NOT MUCH OF A DO IT YOUR-SELFER? You can also purchase nail polish remover pens and makeup remover pens on Amazon, as well as some of your local stores (possibly Target, Walmart, Walgreens, or CVS). BUT, it’s quite a bit cheaper to make your own, and obviously easier to customize them with the products that you like.